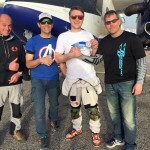 Congratulations to Chris France for getting his USPA AFF Instructor rating at Skydive Spain. Good job, mate! You have well deserved it! Have fun with your upcoming “real” student jumps.